A large Pennsylvania landfill is using bioreactor technology to generate landfill gas more quickly-at two to three times the normal rate-as part of a$35 million project to produce pipeline grade methane gas. It's taken a lot of effort, but all of the pieces have finally come into place so that pipeline grade methane gas is now being produced from landfill gas-that would otherwise would have been flared-at one of America's largest solid municipal waste disposal facilities, in Pennsylvania. A number of players are involved in this project, which required a $35 million investment from Virginia-based Beacon Landfill Gas Holdings LLC. The project involves connecting and modifying the existing gas collection pipeline network and building the gas processing and transportation infrastructure to transmit the 6,000 MMBtu per day of pipeline quality methane gas to market. The gas plant started production in July 2007. This landfill gas recovery project is the largest high Btu project of its kind in the United States. American Landfill Gas Company LLC, which is part owner of Beacon, has been the operator of the landfill gas recovery project at the Greentree Landfill for the past five years. The landfill itself, located in Kersey, Pennsylvania, is owned by Veolia Environmental Services, which is a division of the world's largest waste service company headquartered in France. The Greentree Landfill is a massive solid waste landfill even by U.S. standards. American landfills are typically about 10 times larger than landfills in Europe, according to Todd Watermolen, vice-president for engineering at Veolia Environmental Services. The Greentree Landfill consists of 230 acres and has a total of 32 million cubic yards of available airspace. In addition to waste collected locally, the landfill also disposes of long haul waste coming from as far away as New York City and New Jersey. The landfill site accepts about 5,000 tons of municipal solid waste daily, and it is projected to continue operating for another 20 years. Although Veolia has had gas recovery projects in Europe since the mid-1980s and operates waste incinerators in the U.S., this is the company's first pipeline quality gas recovery project in the U.S. Watermolen says the company has been working to establish a gas recovery project at the landfill for the past 10 years. But all the necessary pre-conditions for the project to become economically viable were not met until recently. In addition to size, which offers the benefits of economies of scale, Veolia uses bioreactor technology in its management of the landfill. Liquid is put back into the waste mass to degrade the biodegradable municipal waste mass faster, meaning that more gas is produced more quickly. In fact, because of this technology, landfill gas is produced at two to three times the normal rate. This is an attractive feature for potential investors as it helps to reduce the timeframe in which the sale of gas offsets the cost of gathering, processing, and transmitting the gas. "Bioreactor technology is becoming more and more of a standard practice," says Watermolen, "but five years ago when this landfill started doing it, it was a new technology." The State of Pennsylvania strongly encouraged Veolia to pursue this technology at that time and it is paying off. The landfill was flaring about 10,000 standard cubic feet of landfill gas per minute. Between 50 and 56 percent of it is methane, with the remainder being mainly carbon dioxide. Beacon is now capturing about 95 percent of the landfill gas for processing. There have been significant technological advances to systems for capturing landfill gas over the past decade, and the Greentree site has been the proving ground for a number of gas separation technology prototypes. One is Air Liquide's membrane technology as well as a pressure swing absorption system. 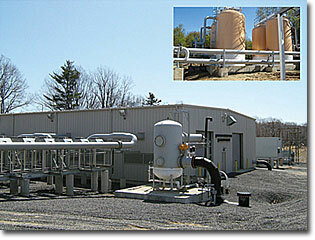 Both allow the carbon dioxide within the landfill gas to be separated from the methane. Research continues in this area to develop the most efficient separation technology. Pennsylvania is a natural gas producing state, and the fact that an interstate gas pipeline passes right by the landfill helped to keep infrastructure costs down. 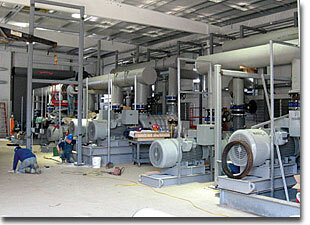 A favorable price for natural gas was also a major factor behind the project proceeding as well. Watermolen says the fact that the price of natural gas is five times what it was five to 10 years ago is the biggest driver behind growing investment in the overall landfill gas recovery industry. The natural gas breakeven price for this project to be economically viable was estimated at about $5 per MMBtu. The existing gas collection system helped Beacon determine the quantity of gas being produced at the landfill, as well as its quality. "It's the emerging technology and the economics that allowed the project to go forward, and make it technically and economically viable," says Watermolen. State governments are also playing a major role by creating a market for green power. Several states now have legislated that a portion of an electric company's portfolio has to include a set percentage of power production using fuel from a renewable energy source. "There has been a large upswing in these kinds of projects because of the value of the energy that is being produced," says Watermolen. The volume of gas being captured at the Greentree Landfill will displace natural gas currently used in the production of about 40 megawatts of electricity, or enough to satisfy the needs of 45,000 homes. The project has earned a national Environmental Protection Agency (EPA) award, as the estimated annual environmental benefits and energy savings associated with the Greentree project are equivalent to reducing carbon dioxide emissions by over 137,000 tons per year or removing emissions equivalent to more than 228,000 vehicles. Large quantities of landfill gas are produced when municipal waste decomposes in a landfill. Because these gases have been identified as an air pollutant, landfills in the United States have been required to flare this gas since the mid-1990s. At that time, the Clean Air Act mandated the reduction of fugitive emissions and odors. Today, almost all larger municipal solid waste landfills in the U.S. have some method for capturing and disposing of landfill gases to comply with the Clean Air Act. Many use the flaring method. Initially, Veolia put in a series of gas extraction wells, gas control valves and piping to pull the gas off that was being produced by the landfill, says Watermolen, and it was sent to both enclosed flares and utility flares that were located on the landfill. He says Veolia recognized very early on that a major potential energy source was being wasted and entered into an agreement with a gas developer in 1998. Unfortunately, that developer had some design and financing challenges, the price for natural gas was well below $5 per MMbtu, and so the project never proceeded. However, the project's fortunes changed for the better with the arrival of American Landfill Gas, and then later, Beacon Landfill Gas Holdings. Together, they brought the logistics, knowledge, experience and financial backing to push the project forward. "When we entered into this agreement with Beacon, they began retrofitting the existing facility so that it would have a greater level of gas controls than were out there previously," explains Watermolen. "And the gas was re-routed to the plant that they constructed, which then processes the gas and sends it down the pipeline." A typical landfill gas well grid features about one well per acre, but in the case of Greentree, the economics made it viable for Beacon to install two gas wells per acre. Taking this more aggressive approach also offers a greater level of control by limiting infiltration of atmospheric air, as nitrogen and oxygen in the landfill gas stream has a negative impact on the gas plant's ability to produce pipeline quality gas. A large industrial electric blade-driven motor pulls the gas from the landfill wells to the processing facility where it undergoes a series of clean-up steps including dewatering, chilling, compression, a carbon treatment to remove volatile organic compounds, as well as a couple of gas separation processes to separate the methane from the carbon dioxide. The carbon dioxide, along with a small percentage of low quality landfill gas, is flared. The methane gas is then transmitted onto the pipeline grid. P. B. Power of Boston and the contractor/project manager consultant was Emcor Energy Services of New York City. AXD supplied the plant blower package and the cooler units, Tormont supplied the compressor skids for the plant, and Air Liquide supplied the MEDAL proprietary membrane system. Gas production is expected to peak in about 20 years, but the actual lifespan of the project is estimated at between 30 to 40 years. With the success of this landfill gas recovery project, Veolia is currently assessing the feasibility of launching similar projects at two of its other U.S.-based landfills. Furthermore, the gas recovery project that is now operational may represent the proverbial tip of the iceberg in terms of the potential for similar projects through the United States, especially now that more landfills are adopting bioreactor technology. According to Veolia, the U.S. ranks as the largest municipal solid waste producer, being the largest consumer nation in the world. Every year, Americans generate more than 180 million tons of solid waste. It's estimated that by the year 2010, this figure will exceed 200 million tons per year.